Open splenectomy is performed in two major clinical scenarios: trauma and hematologic disease. The spleen is one of the most frequently injured intraperitoneal organs, and management of splenic injuries may require splenectomy or, rarely, splenorrhaphy. The spleen is an wedge-shaped organ that lies in relation to the ninth and 11th ribs, located in the left hypochondrium and partly in the epigastrium; thus, it is situated between the fundus of the stomach and the diaphragm. The spleen is highly vascular and reddish purple; its size and weight are variable. A normal spleen is not palpable. For more information about the relevant anatomy, see Spleen Anatomy. The spleen's key function is the removal of old red blood cells (RBCs), defective circulating cells, and circulating bacteria. In addition, the spleen helps maintain normal erythrocyte morphology by processing immature erythrocytes, removing their nuclei, and changing the shape of the cellular membrane. Other functions of the spleen include the removal of nuclear remnants of RBCs, denatured hemoglobin, and iron granules and the manufacture of opsonins (properdin and tuftsin). CT scan of abdomen showing grade IV splenic injury. 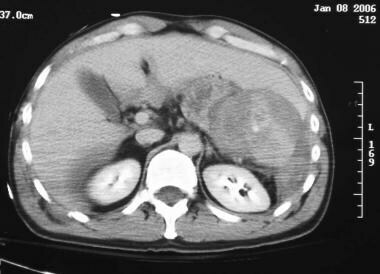 CT scan of abdomen demonstrating grade IV injury of spleen. 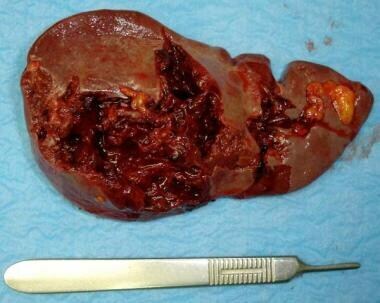 Resected traumatized spleen with multiple lacerations. 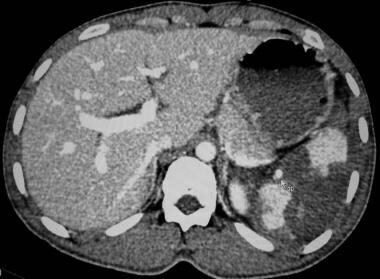 CT scan of abdomen demonstrating large delayed rupture of subcapsular hematoma of spleen in symptomatic polytrauma patient previously managed with percutaneous angioembolization. Patients with various hematologic disorders may benefit from splenectomy. Splenomegaly (see the image below) is observed in conditions such as idiopathic (immune) thrombocytopenic purpura (ITP),  thrombotic thrombocytopenic purpura (TTP), and hereditary spherocytosis. Of these, ITP is the most common indication for elective splenectomy. In hereditary spherocytosis, the RBCs have a tendency to be trapped and destroyed in the spleen. The main features of this disease include anemia, reticulocytosis, jaundice, and splenomegaly. 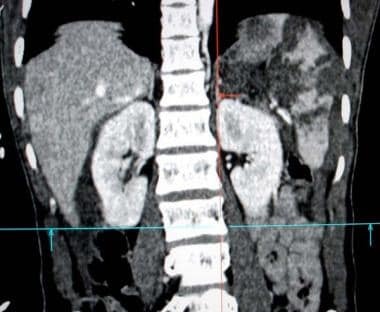 Severe (massive) splenomegaly occupying most of left abdominal cavity in patient with symptomatic hematologic disorder after failure to respond to medical therapy. Generally, the operation should be delayed until the patient is at least 6 years old to minimize the risk of overwhelming postsplenectomy sepsis (OPSS; also referred to as overwhelming postsplenectomy infection [OPSI]). [17, 18, 19, 20] After removal of the spleen, the erythrocytes achieve a normal life span, and the jaundice, if present, disappears in a timely manner. Other, less common hematologic indications for splenectomy include thalassemia and sickle cell anemia. Contraindications for open splenectomy are few. For elective open splenectomy, the only absolute contraindications are uncorrectable coagulopathy and severe cardiovascular disease that prohibits the administration of general anesthesia. Cocanour CS. Blunt splenic injury. Curr Opin Crit Care. 2010 Dec. 16 (6):575-81. [Medline]. Scarborough JE, Ingraham AM, Liepert AE, Jung HS, O'Rourke AP, Agarwal SK. Nonoperative Management Is as Effective as Immediate Splenectomy for Adult Patients with High-Grade Blunt Splenic Injury. J Am Coll Surg. 2016 Aug. 223 (2):249-58. [Medline]. Maurus CF, Schäfer M, Müller MK, Clavien PA, Weber M. Laparoscopic versus open splenectomy for nontraumatic diseases. World J Surg. 2008 Nov. 32 (11):2444-9. [Medline]. Chen J, Ma R, Yang S, Lin S, He S, Cai X. Perioperative outcomes of laparoscopic versus open splenectomy for nontraumatic diseases: a meta-analysis. Chin Med J (Engl). 2014. 127 (13):2504-10. [Medline]. Poulin EC, Schlachta CM, Mamazza J. Splenectomy. Ashley SW et al, eds. ACS Surgery: Principles and Practice. Hamilton, ON: BC Decker Inc.; 2010. Hassan ME, Al Ali K. Massive splenomegaly in children: laparoscopic versus open splenectomy. JSLS. 2014 Jul-Sep. 18 (3):[Medline]. [Full Text]. Liu Y, Zhao L, Tang Y, Zhang Y, Shi SC, Xie FX, et al. Laparoscopic versus open splenectomy and devascularization for massive splenomegaly due to portal hypertension. J Huazhong Univ Sci Technolog Med Sci. 2016 Dec. 36 (6):876-880. [Medline]. Shin RD, Lis R, Levergood NR, Brooks DC, Shoji BT, Tavakkoli A. Laparoscopic versus open splenectomy for splenomegaly: the verdict is unclear. Surg Endosc. 2018 Aug 27. [Medline]. Williams BH, Minei JP. Spleen. Moore EE, Feliciano DV, Mattox KL, eds. Trauma. 8th ed. New York: McGraw-Hill Medical; 2017. Chap 30. Theodoropoulos J, Krecioch P, Myrick S, Atkins R. Delayed presentation of a splenic injury after colonoscopy: a diagnostic challenge. Int J Colorectal Dis. 2010 Aug. 25 (8):1033-4. [Medline]. Crawford RS, Tabbara M, Sheridan R, Spaniolas K, Velmahos GC. Early discharge after nonoperative management for splenic injuries: increased patient risk caused by late failure?. Surgery. 2007 Sep. 142 (3):337-42. [Medline]. Wang C, Tu X, Li S, Luo G, Norwitz ER. Spontaneous rupture of the spleen: a rare but serious case of acute abdominal pain in pregnancy. J Emerg Med. 2011 Nov. 41 (5):503-6. [Medline]. Renzulli P, Hostettler A, Schoepfer AM, Gloor B, Candinas D. Systematic review of atraumatic splenic rupture. Br J Surg. 2009 Oct. 96 (10):1114-21. [Medline]. Watson GA, Rosengart MR, Zenati MS, Tsung A, Forsythe RM, Peitzman AB, et al. Nonoperative management of severe blunt splenic injury: are we getting better?. J Trauma. 2006 Nov. 61 (5):1113-8; discussion 1118-9. [Medline]. McIntyre LK, Schiff M, Jurkovich GJ. Failure of nonoperative management of splenic injuries: causes and consequences. Arch Surg. 2005 Jun. 140 (6):563-8; discussion 568-9. [Medline]. Li Y, Zhang D, Hua F, Gao S, Wu Y, Xu J. Factors associated with the effect of open splenectomy for immune thrombocytopenic purpura. Eur J Haematol. 2017 Jan. 98 (1):44-51. [Medline]. Cáp J. [Long-term clinical experience with spherocytic hemolytic anemia in children]. Cesk Pediatr. 1992 Oct. 47 (10):592-5. [Medline]. Meekes I, van der Staak F, van Oostrom C. Results of splenectomy performed on a group of 91 children. Eur J Pediatr Surg. 1995 Feb. 5 (1):19-22. [Medline]. Alizai NK, Richards EM, Stringer MD. Is cholecystectomy really an indication for concomitant splenectomy in mild hereditary spherocytosis?. Arch Dis Child. 2010 Aug. 95 (8):596-9. [Medline]. Sandler A, Winkel G, Kimura K, Soper R. The role of prophylactic cholecystectomy during splenectomy in children with hereditary spherocytosis. J Pediatr Surg. 1999 Jul. 34 (7):1077-8. [Medline]. Cines DB, Blanchette VS. Immune thrombocytopenic purpura. N Engl J Med. 2002 Mar 28. 346 (13):995-1008. [Medline]. Demetriades D, Lam L. Splenectomy and splenorrhaphy. Fischer JE, Jones DB, Pomposelli FB, Upchurch GR Jr, Klimberg VS, Schwaitzberg SD, et al, eds. Fischer's Mastery of Surgery. 6th ed. Philadelphia: Wolters Kluwer; 2012. Vol 2: Chap 175. Winslow ER, Brunt LM, Drebin JA, Soper NJ, Klingensmith ME. Portal vein thrombosis after splenectomy. Am J Surg. 2002 Dec. 184 (6):631-5; discussion 635-6. [Medline]. Bisharat N, Omari H, Lavi I, Raz R. Risk of infection and death among post-splenectomy patients. J Infect. 2001 Oct. 43 (3):182-6. [Medline]. Okabayashi T, Hanazaki K. Overwhelming postsplenectomy infection syndrome in adults - a clinically preventable disease. World J Gastroenterol. 2008 Jan 14. 14 (2):176-9. [Medline]. [Full Text]. Kimmig LM, Palevsky HI. Review of the Association between Splenectomy and Chronic Thromboembolic Pulmonary Hypertension. Ann Am Thorac Soc. 2016 Jun. 13 (6):945-54. [Medline]. Left oblique abdominal incision showing severe (massive) splenomegaly in patient with hemolytic disorder. Placement of vascular loops during dissection is recommended to help control splenic vessels in cases of severe (massive) splenomegaly.